How is MITRE making the computers in your car more secure? 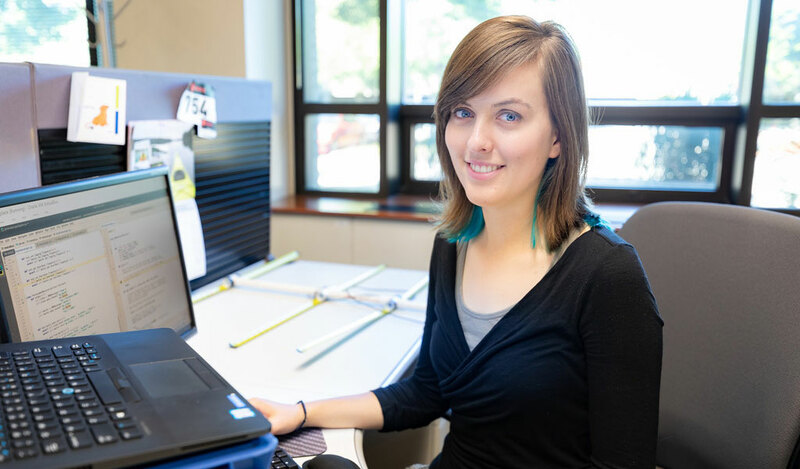 Intern MaryAnn VanValkenburg can tell you—by testing and verifying the security of the system components embedded in the vehicle. VanValkenburg, a senior at Worcester Polytechnic Institute (WPI), spent five months at MITRE designing a way to test embedded security systems. She had the best of both worlds—a 2018 summer internship working with other interns and then another seven weeks in the fall completing her Major Qualifying Project (MQP) for her college degree. Embedded systems security is an emerging discipline—especially on college campuses—but one MITRE has been leading for years. Because embedded systems are computers built into larger, more complex mechanical systems, the cybersecurity of an embedded system relies on the security strength of each of its components. That's why MITRE is researching new protocols to ensure the computers embedded in vehicles are secure and resilient—and help keep everyone on the road safer. "This summer my team worked on designing a computer program that makes it easier to test the embedded systems inside vehicles," VanValkenburg says. It's an area continually being expanded as more and more cars are sold with computer-aided systems such as automatic parking and lane departure notifications. "Our goal was to make an easy-to-use and device-agnostic program that can verify the security of the computer systems inside cars, planes, power plant control systems, and other machines that have embedded systems." She created a messaging protocol that enables synchronized testing across multiple systems by simply plugging the testing devices together. "The protocol I designed allows you to test multiple systems [several cars] at the same time. Because the systems were linked you could test multiple functions such as how a car’s lane assist technology would respond when another car tried to merge into that lane." The potential uses extend far beyond cars. "You could also use this protocol to test a challenge-response interaction between two planes that are physically separate but operating within the same environment," she adds. MITRE and WPI have a long history of collaboration that includes the opportunity for students to complete their MQPs on our Bedford, Massachusetts, campus. The students work on MITRE-sponsored design projects over a seven-week period, from late summer into fall. In VanValkenburg's case, the MQP gave her the opportunity to take her summer project to the next level. "Basically, my MQP project extended the existing embedded testing framework I contributed to during my internship with the goal of making it more flexible," she says. "Imagine that you have a bunch of little black boxes that can talk to each other. You connect one to your computer and one to your car so that you can run code on your car from your computer. This summer, I helped build the concept of the little black boxes. "This fall I it took one step further and wrote the language the black boxes can use to talk to each other." MITRE takes great pride in running a robust internship program that gives students the ability to learn and grow. Our interns can participate in contests such as our annual hackathon and embedded Capture-the-Flag (eCTF) competition. They can attend networking events, lunchtime seminars, early career programs, and technical exchange meetings. They can even partner with full-time staff in mentoring relationships that often continue after they return to school. VanValkenburg can attest to many intern opportunities. She wrote code all night during the hackathon in July. She showcased her work at the Student Expo and participated in a fox hunt (radio transmitter locating competition) run by MITRE's Dan Sinkiewicz. She felt fortunate to be able to work with Nick Brown, her MITRE mentor, as well as to participate in some mentoring of younger interns herself. "It's been a great experience."